Alex Coccia, a 2014 University of Notre Dame graduate, has been selected to the American Rhodes Scholar Class of 2015. Rhodes Scholarships provide all expenses for graduate study at the University of Oxford in England. A Columbus, Ohio native, Coccia was selected from a pool of 877 candidates who had been nominated by their colleges and universities. He is Notre Dame’s 15th Rhodes Scholar and first since 2002. This year’s 32 Rhodes Scholars will commence their studies at Oxford in October 2015. Currently a Truman-Albright Fellow in the U.S. Department of Health and Human Services in Washington, D.C., Coccia majored in Africana studies and peace studies in Notre Dame’s College of Arts and Letters. He is interested in a career in politics and international human rights law. A participant in the University’s Glynn Family Honors Program and the Kellogg Institute for International Studies’ International Scholars Program, Coccia traveled to Africa twice during his undergraduate years. In summer 2011, he taught fencing to schoolchildren in Uganda as a volunteer with Fields of Growth International. In 2012, Coccia returned to East Africa to conduct research for his senior thesis on the legacy of reconciliation in post-genocide Rwanda. The yearlong, independent research project included more than 60 interviews with Rwandans from two sectors in the Southern Province. “I have been interested in the genocide in Rwanda since high school and wanted to use this as an opportunity to combine my passion for restorative justice practices and my academic interest in community-based development,” he said of his senior thesis. In 2013-14, Coccia served as Notre Dame’s student body president, running on a platform focused on promoting the passions and interests of all students, including those who feel marginalized. He worked to serve peers and improve the campus climate on a variety of issues, most notably to increase awareness for students who identify as LGBTQ minority students, students who are undocumented citizens, and students impacted by sexual violence. “Alex did what we hope all students will do as undergraduates at Notre Dame. 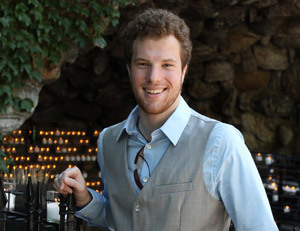 He took his learning experience beyond the classroom and took full advantage of all the resources on campus to discern his path, cultivate his gifts, and serve as a transformational leader,” said Deb Rotman, Paul and Maureen Stefanick Faculty Director in the Center for Undergraduate Scholarly Engagement. Involved in numerous Notre Dame clubs and activities, Coccia also served as president of the Progressive Student Alliance, steering committee member for the Call to Action Committee, and founder of the 4 to 5 Movement. He was also a member of the Fighting Irish varsity fencing team, which won the 2011 National Championship. “It’s an incredible honor, and I’m humbled to be named a Rhodes Scholar representing the University of Notre Dame,” he said. “I am deeply grateful for the support and invaluable mentorship I’ve received over my time at Notre Dame—from faculty, staff, and my fellow students. The mission of the Rhodes Trust is reflected in our own, to engage critically so that learning becomes service to justice. Coccia plans to pursue a graduate degree in comparative social policy at Oxford. He advanced through a rigorous multi-step selection process for Rhodes Scholarship applicants, which includes seeking endorsement from their college or university. This year, approximately 1,600 students sought their institution’s endorsement; 877 were endorsed by 305 colleges and universities. Committees in each of 16 U.S. districts then invited the strongest applicants for interviews. Coccia worked closely through the application process with CUSE, which assists students and alumni with fellowships applications. Individuals interested in applying for the Rhodes and other awards are encouraged to visit http://fellows.nd.edu. Allison Wettstein, a Chinese and accountancy major in the Notre Dame Class of 2013, was also a Rhodes Scholar finalist this year.